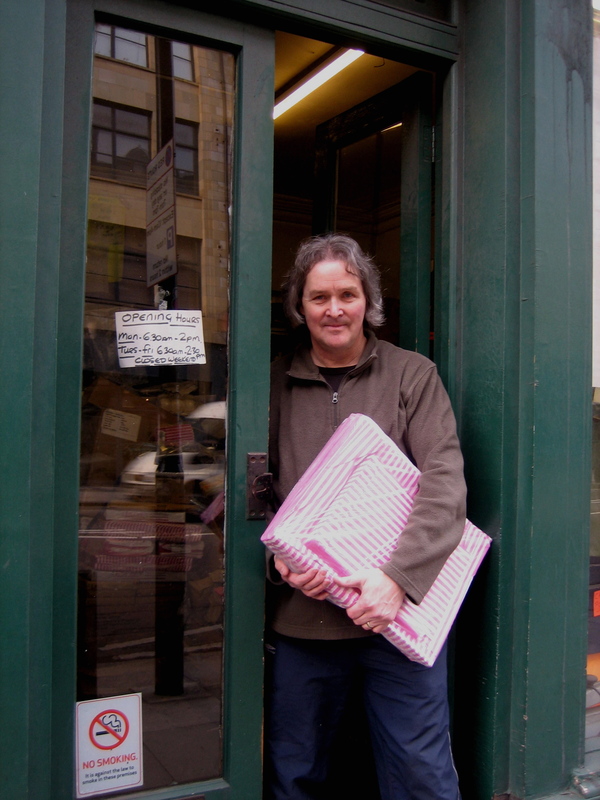 Recently, I have taken to dropping in to the premises of my new friend Paul Gardner, the paper bag seller at 149 Commercial St, to observe the constant parade of long-standing customers that pass through, creating the life of this distinctive business. One morning, I called round at six thirty, opening time, to enjoy a quiet chat before the rush and Paul explained that his great-grandfather James Gardner began trading here in this same building as a Scalemaker when it was built in 1870 – which means Paul is a fourth generation Market Sundriesman and makes Gardners the longest established family business in Spitalfields. Paul still has his great-grandfather’s accounts from the end of the nineteenth century, when as Scalemakers they serviced the scales for all the traders in the fruit and vegetable market on a regular basis. Turning the pages and scanning the lines of James’ fine copperplate handwriting your eye alights upon the names, Isaac, Isaiah and Ezekiel, indicative of the Jewish population that once defined the identity of Spitalfields. There is an ancient block of wood with two scoops carved out that are smoothed with wear, it has been in use since the days of Paul’s great-grandfather. Then his son Bertie (Paul’s grandfather) used it, then Bertie’s son Roy (Paul’s father) used it and Paul still keeps his cash in it today. As the twentieth century wore on, each of the successive Mr Gardners found that customers began to expect to buy their produce in a paper bag (a trend which is now reversed) and so the trade of dealing in bags supplanted the supply of scales entirely over four generations. Paul Gardner’s customers are the stallholders and small businessmen and women of East London, many of whom have been coming for more than twenty years, especially loyal are the Ghanaian and Nigerian people who prefer to trade with a family business. Paul will sell small numbers of bags while others only deal in bulk and he offers the same price per bag for ten as for a hundred. Even then, most of his customers expect to negotiate the price down, unable to resist their innate natures as traders. Paul explained to me that some have such small turnovers they can only afford to buy ten carrier bags at a time. Ruminating upon the problem,“They’ve dollied-up the place round here!” says Paul quietly, in an eloquently caustic verdict upon this current situation in which his venerable family business finds itself now, after a hundred and forty years, in a fashionable shopping district with a landlord seeking to maximize profits. 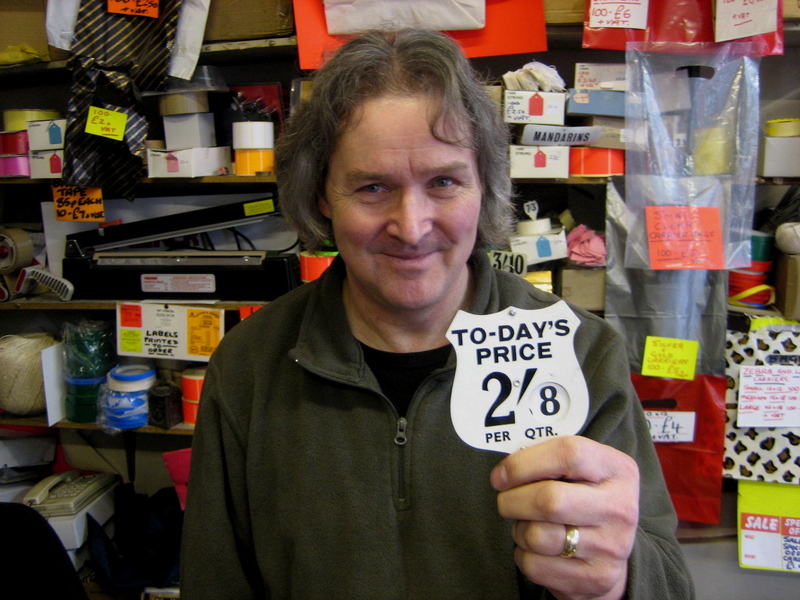 Paul needs to renegotiate his rent increase and we must support Paul by sending more business his way (at the very least, everyone go round and buy your bin bags from him), because Paul is a Spitalfields legend we cannot lose. But more important than the history itself, is the political philosophy that has evolved over four generations of experience. It is the sum of what has been learnt. In all his many transactions, Paul unselfconsciously espouses a practical step-by-step approach towards a more sustainable mode of society. Who would have expected that the oldest traders in Spitalfields might also turn out to be the model of an ethical business pointing the way to the future? 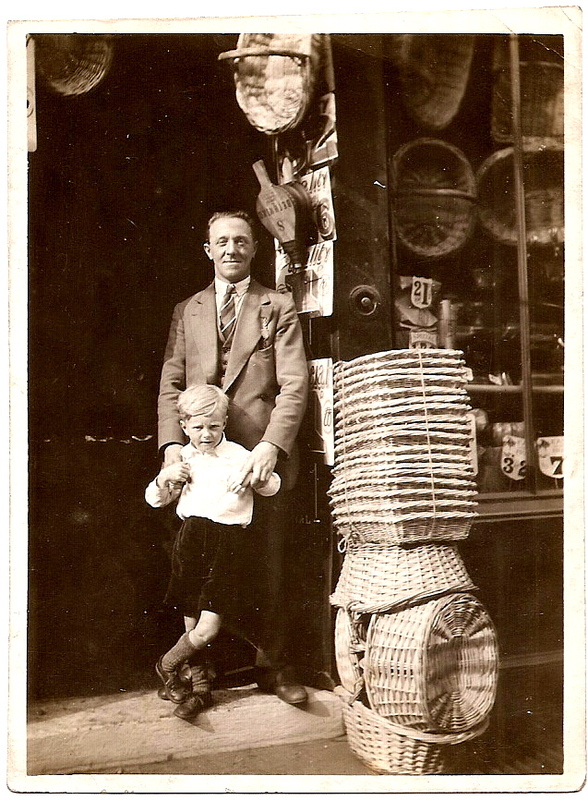 Below you can see Paul’s grandfather Bertie Gardner, standing with Paul’s father Roy Gardner as child outside the shop around 1930. 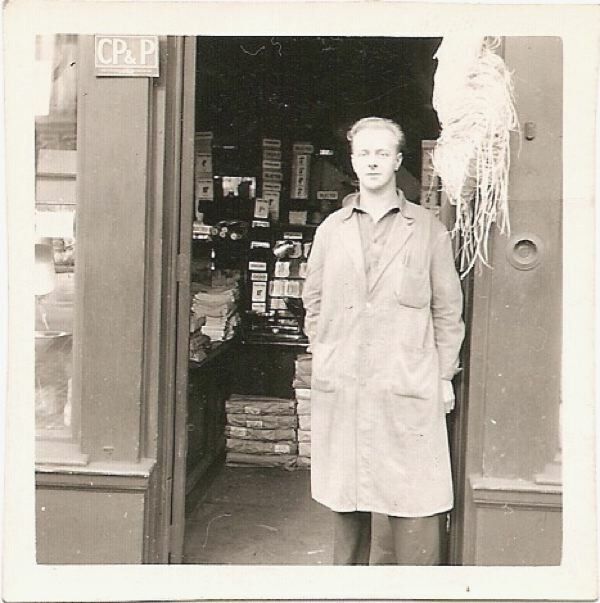 In the next picture you see Roy, now a grown man, standing outside the shop after World War II, around 1947. The third picture is Paul Gardner outside his shop today. I keep my fingers crossed for Paul! Businesses like his, close to people, historically linked with the neighbourhood, must go on. While reading Spitalfields Life, I would love to walk there again with your notes as a guidebook, seeing them all still operating. The character of areas in London depends on them – not on the quick benefits without heart!!! Dear Gentle Author, thank you for writing about people and places that build up Spitalfields and I do hope that your work helps their voices be heard, so that their business will thrive for long. I will look for Paul’s establishment when I bring my Dear In-Laws to London the beginning of May … hadn’t explored much of Spitalfields before DH and my last visit….need to correct that post-haste! It’s heart-warming to hear that courtesy and caring for others has not gone completely away in this world of ours….thank you for sharing Paul with your readers. What wonderful memories this provoked. On reading it I was talking to my mum about the old lady who always sold carrier bags on Brick Lane/ Club Row. This must have been in the 60s and 70s (I was born in 1963) when we spent a lot of time visiting my grandad while he was plying his trade in Club Row and then at my grandparents house (full of the caged birds he sold) in Hollybush Gardens. We used to hate visiting my nan and Charlie pop as we called him as the time spent there seemed to last forever (and they had very loud ticking clocks to remind you of just how slowly time was passing) and tea was served with ‘stera’ milk. Anyway my mum then started to reminisce about Prince Monolulu, a tall black man who could be seen in the area. He always wore feathers on his head and sold racing tips shouting ‘I’ve got an ‘orse’. I can’t remember him – it seems he died in 1965 – and thought maybe she had dreamt him. But he’s there in Wikipedia and elsewhere on the web. Many thanks for the memories – from my 77 year old mother and myself! I have bought my carrier bags and calico bags at Paul Gardner’s shop from time to time and it’s upsetting to find yet another gem is under threat. He is the only tradesman that sells at such great prices and as a small business this works for me. Last year I bought some paper bags online and to get the price down I needed to buy in bulk….needless to say, I still have quite a few left. I now see what an impact your writing can have on people and local business- I used to shop around for for certain colours and qualities, but now I’m persuaded to continue buying from Paul on a regular basis, I’d hate to see his business be taken away. I discover Paul’s store 2 weeks ago, since I’m buying my bags there. He’s very nice, and his prices are really affordable, mostly for a little business like mine. So many wonderfull memories come flooding back.Bought my first puppy down Club Row ,always went down the Lane Sunday mornings and came back with pickled herrings ,winkles and Beigals for tea . I can’t tell you how this Spitalfieldslife set of daily mails has been so special. It has brought home to both my brother and I of how our father was brought up in Artillery Lane – sort of how it was then and how life has carried on since then of togetherness and bonding to not only forge ahead but almost all of you have found your niche going forward. I and my brother, far away in South Africa and Botswana, feel that it has brought London closer – as to how it used to be. Thank you! Enjoy reading new stories everyday, so many thanks G.A. Funnily enough I embarked on a slightly quirky but unfortunately non- profit making business idea and certainly better than anything I have seen in the high street shops…..homemade Christmas Weaths and Decs of different themes…Woodlandy, Traditional etc etc, this year or should I say last year, since today is the 1st day of another year. London is my favorite city and I cannot get back often enough. When I am there I stick to the out of the way shops and streets where businessmen the David are trying to make a living and carry on in a tradition that makes this city as a whole so unique. Thank you for giving us this story and for keeping Spitalfields alive for those of us who cannot be there. Great piece about Justin and Louise- Bakers rock…and Roll!!! What a heart-warming story! It’s fascinating to discover the stories of the small businesses in the Spitalfields area. Wishing all the best to Paul, hopefully things work out. Small shops like this are what give neighbourhoods character and continuity. It’s safe bet the building owner has absolutely no ties to the neighbourhood whatsoever, and has most likely never even seen this shop. There should be government subsidies for folks like this man, to keep a bit of history, and what is clearly a viable business going. The monies that are wasted in six months for a single chav on benefits would cover this mans’s rent difference, and would be money well spent–there would be something to show for the government’s investment, which is not the case for the former.